This Italian Salad Recipe doesn’t just have a great texture – it also provides the wonderful flavor combinations of tangy and mildly bitter, with a hint of salt and sweetness that will leave you wanting more. I recently had a conversation with a colleague of mine as to when salads should be served: before, or after, the main course? A Seafood Salad is without a doubt the best appetizer salad and a Italian Potato Salad is a great side salad dish. 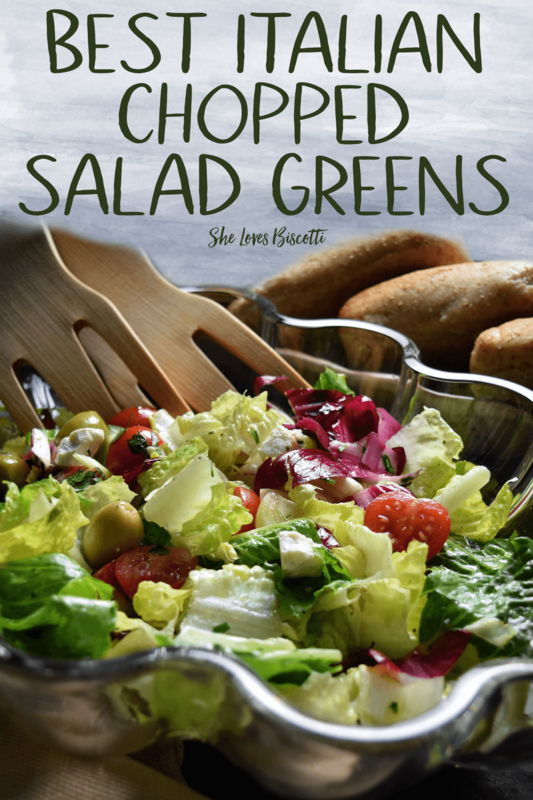 My Italian upbringing dictated that green salad recipes are served at the end of a (big) meal… before the onslaught of cheese, fruit and, of course, desserts. When do you serve this Italian salad? During the same conversation, my colleague and I also discussed easy vs complicated recipes. I don’t know about you, but when hosting, especially during the holidays, I like to have a balance between the two. 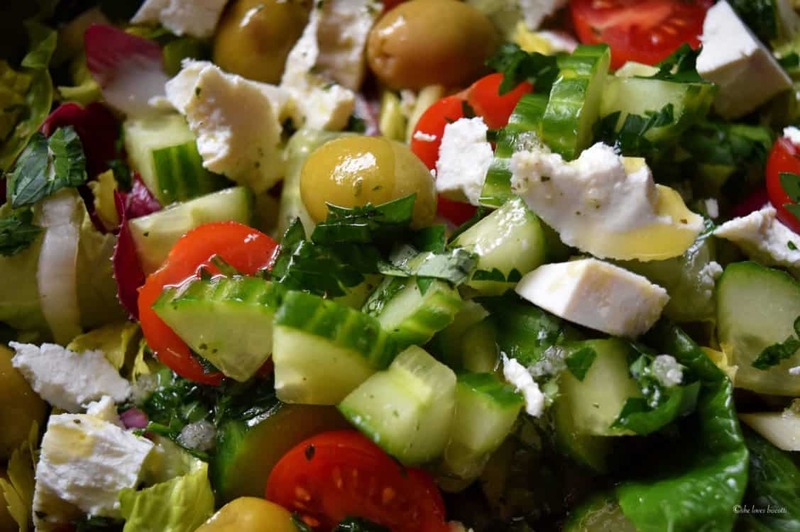 The presence of easy recipes gives me a sense of security, and creates an illusion that I have everything under control 😉 And nothing can be easier than a salad like this one. 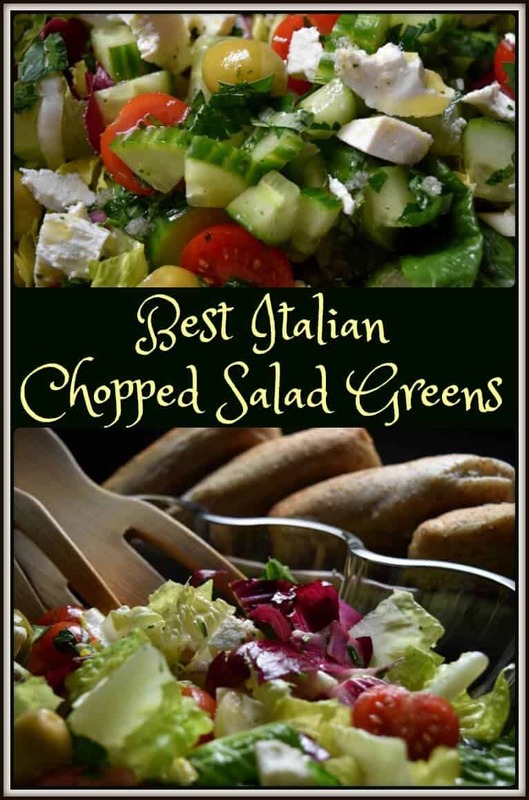 I can also assure you that it does not get any tastier than this Best Italian Chopped Salad Greens Recipe. 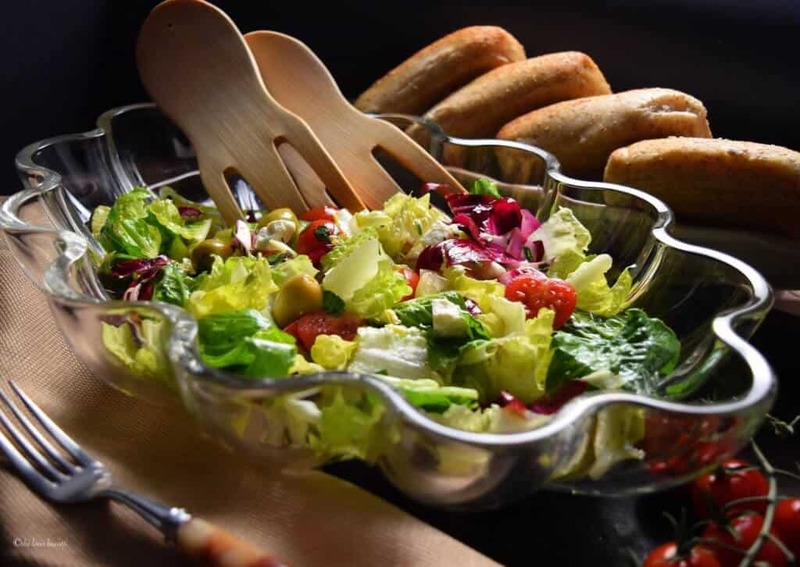 Even if you are stuffed, you will always manage to have a few extra bites of this tossed Italian salad. As in most salad recipes, you must put together two parts: the actual salad, and the dressing. I will usually combine the ingredients for the dressing in a mason jar, shake it vigorously, refrigerate it, and forget about it until I am ready to dress my salad. I will usually prepare the salad dressing the day before the big event. As far as the actual salad recipe is concerned, I like to use a mixture of greens such as romaine, radicchio and endive. I think everyone is familiar with romaine lettuce. But what about these white veined purplish leaves? Well, radicchio belongs to the chicory family, and has a distinctive, slightly bitter taste. According to Wikipedia, the vegetable can be traced back to the fifteenth century in the Veneto region of Italy. Radicchio is extremely pleasing to look at, and it’s a slightly healthier green than, say, iceberg lettuce! 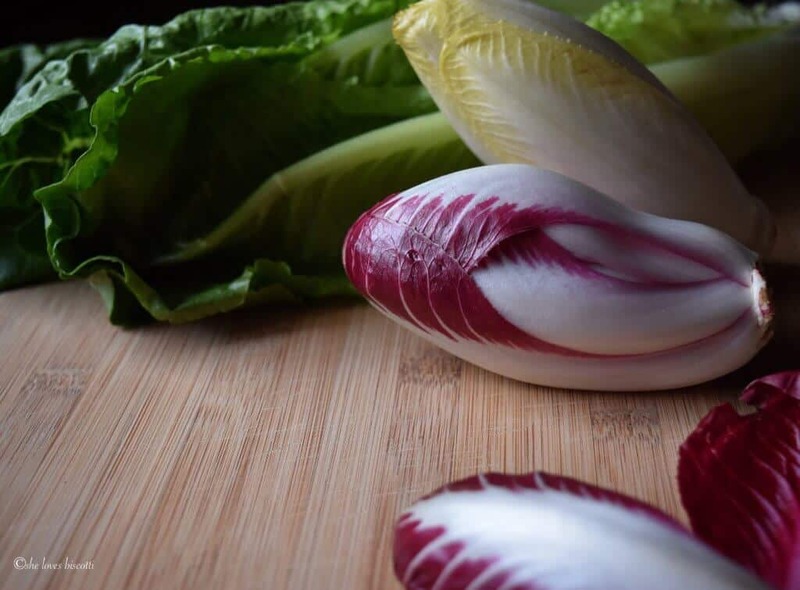 As far as the endive is concerned, it also belongs to the chicory family. It is equally crispy, providing a slightly bitter taste, but is a lot nuttier than the radicchio. Both of these veggies will provide you with a healthy dose of vitamins, minerals, and even a little bit of fiber. You are probably familiar with the rest of the salad ingredients. I would like to bring your attention to just two others. The first is the Roasted Garlic Cloves. It really is an easy recipe to make, and it is a game changer as far as taste is concerned. The second is the ricotta salata. As you probably know, ricotta is a sheep milk’s cheese. 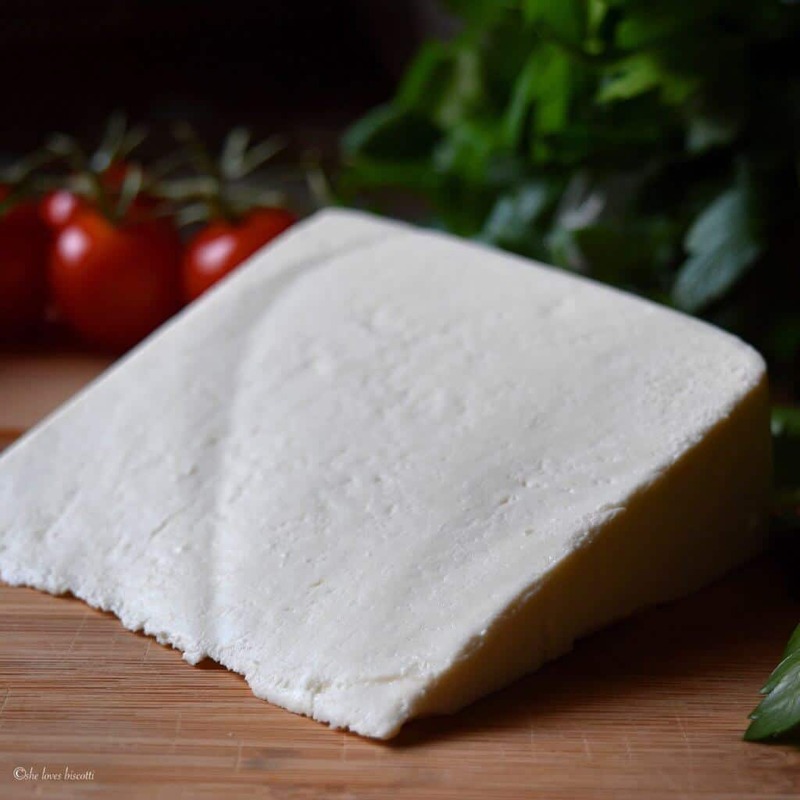 Unlike its fresh, moist and wet counterpart ( Creamy Homemade Fresh Ricotta Cheese ), ricotta salata is an aged, pressed cheese whose final product has a crumbly, yet firm texture, with a salty, almost tangy flavor. It is great to use in salads as it complements the bitterness from the greens perfectly. You should be able to find this cheese in your specialty cheese shop. I will usually toss all the salad ingredients together. Then, when the time is right, just pour the dressing over the top, toss and plate. Simply serve with a nice crusty bread. Whole wheat, of course! Along with this Refreshing Italian Fennel Citrus Salad, this was one of my Mom’s signature salads. Both of these salads are so ridiculously easy to put together. As an added bonus, they are definite crowd pleasers. 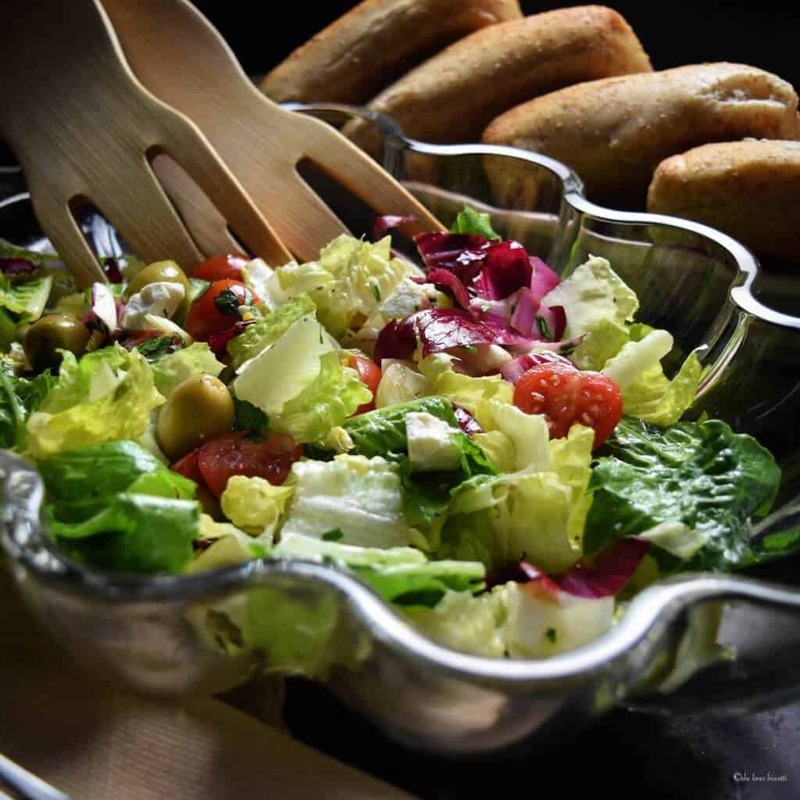 This Italian green salad will provide you and your guests with a colorful and tasty way to end any meal. I hope you enjoy this recipe. 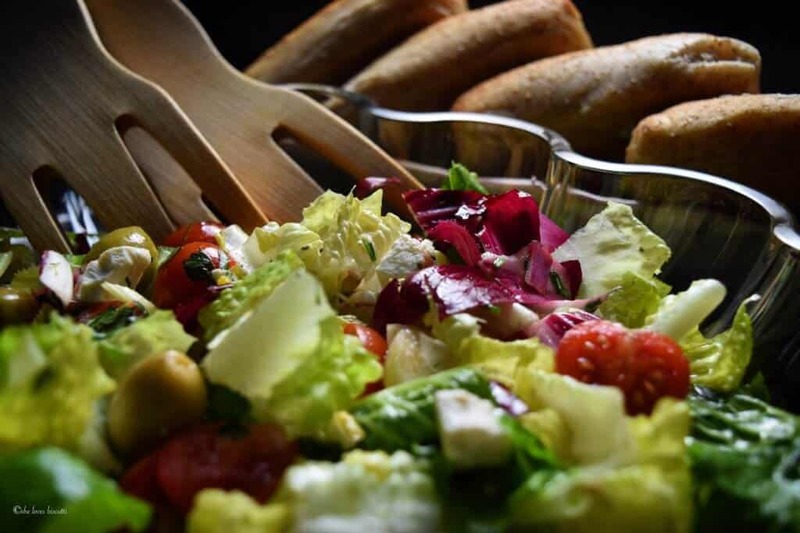 ★★★★★ If you have made this Italian chopped salad recipe, I would love to hear about it in the comments below and be sure to rate the recipe! 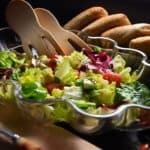 This Italian Salad Recipe has great texture & provides wonderful flavor combinations in just one bite. Combine all the ingredients for the dressing in a mason jar. Refrigerate until ready to be used (I will usually make the dressing the day before I need it). In a large mixing bowl, add all the salad ingredients. Shake the dressing one final time before pouring over your salad. Transfer to your serving platter. LOVE THIS RECIPE? PIN IT TO YOUR SALADS BOARD! Thank you so much for posting this. My fiance declared that this was the best salad he ever had in his life! This is my kind of salad! Lovely, delicious and so nutritious! 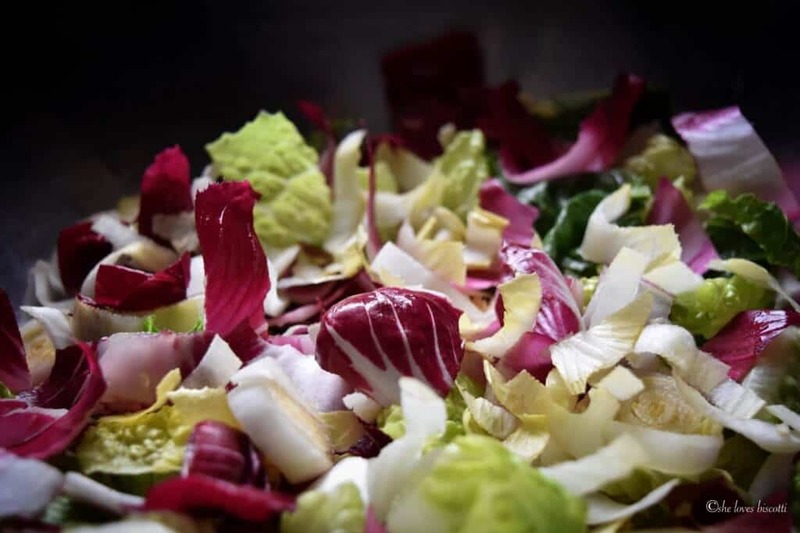 Loved seeing the use of radicchio, together with romaine and endive, and also ricotta salata. No cucumbers, for me, though, but that’s my personal taste 🙂 . I’ve always known that the salad has to be enjoyed at the end of the meal or as a side to the “secondo”. I’ve never seen anyone in Italy starting with a salad, unless it is in antipasto form (like insalata di mare with seafood). Pinned it, so beautiful! Always after the meal…no question. That being said this salad is a meal in and of itself and your instructions for preparing it as part of a large meal are spot on.